This image depicts a sign which was typically seen in South Africa during the country's years of apartheid. In 1652, the Dutch East India Company needed a provisioning post in the Cape of Good Hope area. Thus began the first European settlements at the southern tip of the African continent. By the end of the 18th century, the British controlled the Cape of Good Hope. As Anglo settlements grew, so did tensions between Afrikaners and English. Partly to separate themselves from British rule, the Afrikaners began a “Great Trek” north. In doing so, they came into conflict with African groups - especially the Zulu. The Boers created two separate republics, the Transvaal (in 1852) - also known as the South African Republic - and the Orange Free State (in 1854). Relations between the British government and the two republics were already strained when two major discoveries ultimately led to a war between Brits and Afrikaners. 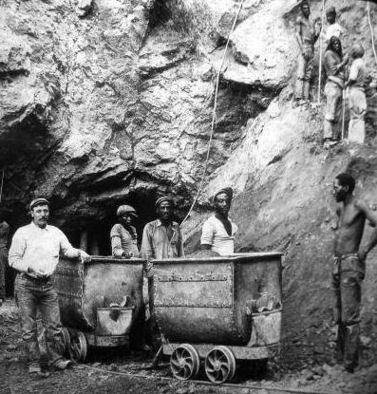 Diamonds were found at Kimberley (in 1867) - near the confluence of the Orange and Vaal Rivers - and large gold deposits were detected in the Transvaal nineteen years later. People flooded the areas, to work and/or seek their fortunes. Sometime between December 1866 and February 1867, Erasmus Jacobs - the son of a poor farmer - found a beautiful pebble along the southern bank of the Orange River. That discovery led to diamond mining, a new South African industry. This image depicts workers at the Wesselton Diamond Mines, in the Kimberely area of South Africa. Online, courtesy Wikimedia Commons. Theophilus Shepstone, the British governor of South Africa, thought it a good idea to annex the Transvaal - as another jewel in the British Empire’s crown. Two Anglo-Boer Wars (of 1880-81 and 1899-1902) were fought to decide the issue. When the wars were over, Britain controlled both of the Boer republics. They, together with Britain’s other colonies (in the Cape and Natal regions) would soon become the Union of South Africa - a self-ruling (except for "natives") dominion of the British Empire. Meanwhile ... it wasn’t just the battle for territory which erupted during the last part of the nineteenth century. As more and more people came to South Africa, to work in the mines and to staff supporting industries, the British-controlled government began to enact race-based laws. One of the more infamous laws required all Indians to be fingerprinted - even people who were not charged with any wrongdoing. Mohandas Gandhi (who was living in South Africa at the time) refused to obey the onerous laws. In a famous speech to his ethnic brothers, Gandhi urged all Indians to non-violently resist the discriminatory laws. In the late summer of 1906, he publicly stated he would die defending his beliefs. Twelve years after Gandhi’s speech, a baby boy was born south of the Transvaal - in the Transkei region. Although he, too, would ultimately choose reconciliation, Nelson Mandela originally followed a different path as South Africa’s form of discrimination - later called “Apartheid” - stifled the country’s non-white population. Bos, Carole "APARTHEID in SOUTH AFRICA" AwesomeStories.com. Dec 01, 2009. Apr 20, 2019.